We like obscure holidays at The Lingua File, and there are few more important to us than the European Day of Languages. In an ideal world every day would be a day of languages... or a Saturday, but sadly, this is not the case. The purpose of this holiday is to promote the linguistic diversity of Europe and to encourage people to recognize and learn new languages. We think that's a great idea. Politicians got something right! Despite the linguistic and cultural diversity of Europe, the continent itself is home to only 3% of the world's languages. That definitely takes it out of the running to be the most multilingual continent. However, we can say that Europe does well in terms of cultural diversity. In comparison with North America, the cultural diversity of Europe is pretty astonishing. In North America, it's fairly uncommon to get on a train in one place and end up in a different country, let alone somewhere they speak a different language. However, in Europe you can hop on a train in Portugal in the morning, travel through Spain, and end your travels in France (assuming that the Spanish train system hasn't let you down) all in one very long day! Just in that one day, you would have had the opportunity to speak Portuguese, Spanish, Catalan, and French. If you continued your journey through Europe, this linguistic diversity would go on and on and on. 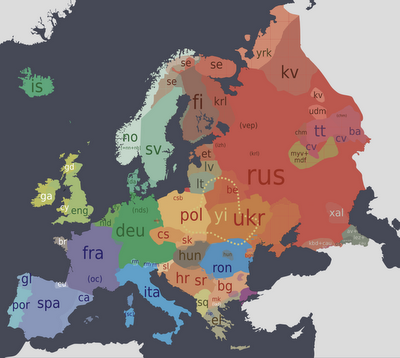 There's much more to European languages than just EFIGS (English, French, Italian, German and Spanish). Europe is home to a multitude of languages (over 200! ), many of which you've probably never heard of. So enjoy your European Day of Languages, and take some time to investigate the linguistic diversity that Europe offers as a continent. Make sure you use it as an excuse to eat some good food and drink some fantastic booze too! Cheers! Živjeli! Kippis! На здравје! Saúde! Iechyd da! That's just a small sample of European languages... English, Bosnian, Finnish, Macedonian, Portuguese and Welsh!